Rwanda, a country of beautiful, rolling, green hills and people who prize hospitality and find joy in the simplicity of daily life, is constantly changing and developing and looking toward a brighter future. This brightness is seen in contrast to some darkness in the country’s history not so long ago. Rwanda is currently in a period of commemoration of the Genocide against the Tutsi people that occurred 25 years ago…with these days focused on remembering those whose lives were lost and committing to never again allow such hatred and violence to grow in the hearts and minds of people. On April 7, 1994, a tragic genocide was initiated targeting one people group (Tutsi) with the killing carried out by the other (Hutu). With guidance from Hutu leaders within the government, neighbors and even family members were encouraged to murder those close to them who were Tutsi. This unthinkable killing continued for 100 days and caused more than one million Tutsi deaths. There were heroes and there were perpetrators but all were Rwandan. Thankfully, there was an end to this horror though some deep effects are still felt today. With a new government in power in these past 25 years, the focus has been on unifying the Rwandan people and bringing reconciliation and healing. There has been so much forgiveness and restoration that will only help this country to move forward towards their brighter future…together. Rwandans are proud of their culture and the ways they are working to build this nation…remembering what has come before but not dwelling on that darkness. Instead, it is a motivating force for growth and resiliency and hope for the days to come. Several of the secondary students sponsored by Urugo Care Rwanda are actively involved in clubs at school that are focused on promoting this unity and peace within the country. They also teach and encourage fellow students to fight against any genocide ideology that may still be simmering. These students are leading the way in claiming a brighter future. 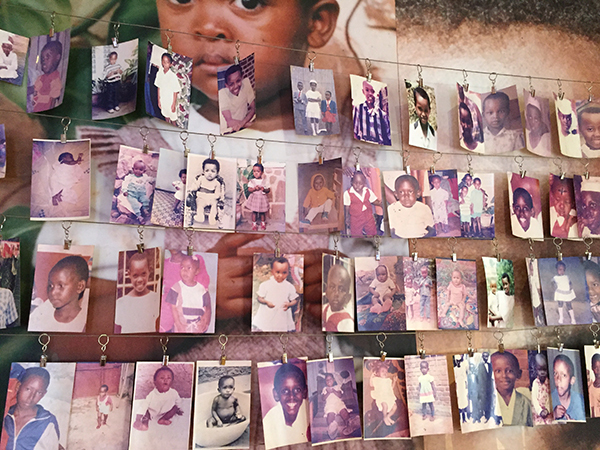 Photos of some of the children who were killed in the Genocide. 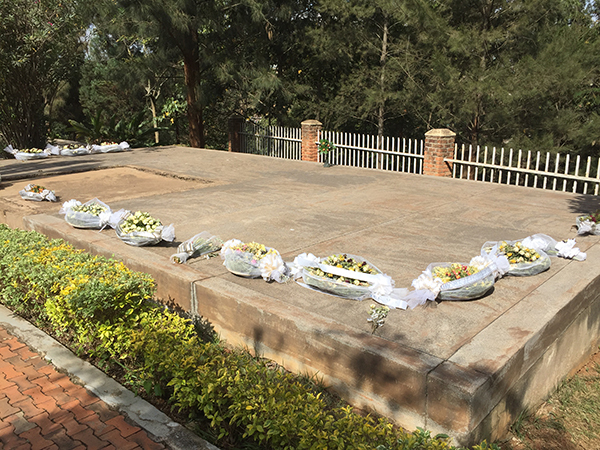 The names of some of those who were killed and now laid to rest in mass graves at the Genocide Memorial in Kigali. Mass graves at the Genocide Memorial in Kigali holding about 250,000 of the more than 1,000,000 people killed during the Genocide against the Tutsi in 1994. Mama Parfait is a single mother (of Parfait, Jules, and Liza) and has been renting one small room for the past 10 years as their home. Prior to this year, Parfait was actually staying elsewhere with an aunt and attending school there so there was less of a burden on his mama...but she brought him home to be part of our program, though I'm sure that has also added difficulty for her. She has worked a variety of jobs, mostly with short-term contracts, doing things such as being a construction helper, cooking, and cleaning. Most recently, she had a job cooking for a family but that position ended at the end of August after the employer lost his job. A few weeks ago, Mama Parfait called our staff Bosco to tell him that she had shifted her family to a new home (still in the village of Akindege) that has two rooms! She invited him to come and visit. When he did, he was pleasantly surprised to see the increased space and that she was using part of the front room as a small boutique (shop) selling some vegetables and other household items. He asked her where she got the money to do this. She replied that two years ago she had a conversation with her kids and discussed how she dreamed they could save some money to be able to one day own their own business. They bought a wooden box that has a slot in the top but no way to open except for breaking. She and the kids all agreed that they would add money to the box each day, even if it meant sacrificing eating or spending money on other needed things. The kids partnered with her in this, adding their own money if they ever received it, and also encouraging her each day to add something to the box, even a small coin. They planned to save money in the box for three years before breaking it. After being sponsored by Urugo Care Rwanda this year, they were able to save even more than before. They decided to break the box after just two years and found it contained about 240,000rwf. This enabled them to rent a larger house and they decided to start a business of having a boutique to sell a variety of things. It is going very well so far and they are hopeful to obtain many customers to keep growing their business. You can see the joy in their faces in the photos below! Household items: spices, salt, sugar, pasta, oil, juice, water, toothpicks, soap, toothpaste, toilet paper, etc. Many important and high-demand items! The happy family team (missing Parfait)! We have helped them by easing the burden of paying school fees but this family has also done the incredible work of thinking of this plan and being unified and committed to carrying it out...without our help! This is beautiful and exactly what we hope for in walking alongside our families in Rwanda. Thanks for your sacrifices that encouraged this family as they were making their own sacrifices as we partner with them to meet their full potential! The new school year has begun in Rwanda! This is an exciting time as many of the students are ready to return to school (or start school) after their long break at the end of the following year. For us, it is a busy time of preparations for our students…both the administrative details but also meeting with the students and encouraging them for the year ahead. We are focused on working with families to partner with them for the benefit of the whole family. With the changes in our program for this year, we are currently sponsoring 29 primary students. We require these students to attend the local government-funded school: Kamashashi Primary School. We pay school fees, buy two uniforms, and provide school materials (backpacks, notebooks, pens) for each student. These little ones are adorable as they eagerly receive their backpack which is sometimes bigger than they are! We are also providing a weekly portion of igikoma (porridge) for each family with students in primary school (read more about this below). We are also sponsoring the more advanced students in these same families. We currently have 50 students attending secondary or vocational schools. Most of our students who are in their first three years of secondary school attend the local government-funded school: Camp Kanombe. Other students may have scored well on national exams at the end of primary school or at the end of these first three years in secondary and are assigned to various other schools all over the country. Similar to the primary students, we pay for school fees, buy uniforms, provide school materials (also including math sets, calculators, and periodic tables), give personal items (soap, laundry soap, lotion, toothpaste, sanitary pads), and pay for transportation costs to/from school if they are not attending the local school. For those students in boarding school, we also provide a trunk, sheets, blanket, pillow, mosquito net, towel, and mattress to comfortably stay while they are away from home. I’m excited to see how these students continue to grow and learn in this new year. We will have challenges along the way that become opportunities for growth and counseling as we strive to invest in their lives beyond simply providing school fees. I’m thankful for these opportunities! We are excited this year to be able to provide a weekly portion of igikoma (porridge) for the families with students attending primary school. Some of the families that we work with are limited in the number of times that they can cook each day. We hope it will be a benefit for the primary students to consistently be able to have this porridge to nourish them. Igikoma can be made using a variety of different flours. We are combining a corn flour (kawunga) with another mixture of nutritious flours (maize, soy bean, sorghum) called sosoma, sugar, and powdered milk. Each week, we will order about 23.5 kilograms (about 52 pounds) of these ingredients to mix and then distribute to the families. We are also very excited that we are hiring a mama (Speciose) from one of the families to have a little job of helping us to do the mixing and bagging of the igikoma mix each week. Speciose mixing the igikoma ingredients...and getting a good arm workout at the same time! Finished project of one week's worth of igikoma ready for distribution! After having been called Global Capacity for nine years, our board of directors felt that it was time for a change. We have selected a new name and logo that are more descriptive and representative of our work. We plan to unveil them on February 13. Stay tuned for an exciting video announcement! There has been substantial interest for a group trip to Rwanda this summer. Our Executive Director, Matthew Heinz, will be leading this inaugural trip and you are invited! Details are tentative, but dates would be around August 1-10 with a cost around $2,500 to $3,000 per person. (If you are fundraising, donations can be sent in to Global Capacity for a tax deduction.) The bulk of the time will be spent with the households we support and at some of our students' schools. We will also take time at a home for former street children and enjoy some cultural activities. Information sessions will be offered soon for preliminary information. If you are interested in joining the team, send an email to Matthew. This family is new to our sponsorship program this year and we are so glad! Kabaganwa Eugenie is the mama with two daughters: Muhoza Nelly and Mudahogora Henriette. Eugenie’s family is Rwandan but they moved to Burundi (near borders with Rwanda and Tanzania) when there was unrest in Rwanda in the late 1950s. They returned to Rwanda after the 1994 genocide against the Tutsis and Eugenie has been renting a house in this local village for the past 20 years. Thankfully, she has a good relationship with her landlord and he gives reasonable increases in rent, though it is still a struggle for her to have enough income for these expenses. Eugenie is very enterprising and works hard to find work in different areas. Sometimes, she can help with masonry work by carrying materials at a construction site. Other times, she takes some of her income from that work and goes to another nearby town to buy tomatoes to resell at the market. She has also recently been starting to do some buying/selling of rice. She has some familiarity with purchasing rice from Tanzania (neighbor to Rwanda) since she grew up near there. She has been working to find customers near where she lives now that would want large quantities (25kg or more) of rice. We are hoping that this business will continue to grow for her! When asked what her dream was, she answered “to be a very good businesswoman”. She would also like to be able to own a house to have more security for her family instead of continuing to rent their home. She is very thankful for this first time of having health insurance for the whole family. We are grateful that we can come alongside this mama and her daughters, helping with school fees and other benefits that can encourage them towards fulfilling their dreams! Thank you for joining us in making dreams in Rwanda come true! Rukundo Moses is the papa of one of the families we work with here in Rwanda. There are five children in the home that he is currently responsible for: one in secondary school (Muhoza Christophe) and four in primary school. Moses is trained in plumbing and is able to occasionally find part-time jobs to earn some income though it is often not enough to cover the expenses of rent and food for the family. Being a single parent causes some additional struggles as Moses can’t be away from home for long periods of time even if some plumbing jobs are available. This family rents a home with two bedrooms and a sitting area, tucked into the side of one of the hills with a beautiful view of the valley and hills beyond. Without an indoor kitchen, most of the cooking happens outside (unless it is raining or night time). The children are helpful with many of the household chores as well as focusing on their schoolwork. When asked about his dream for the future, Moses responded “for the kids to keep studying and reach a different place in their future”. He has great hope for this! As we continue to partner with this family, it is a gift to be able to encourage Moses and be a part of the work that he is doing to accomplish this dream for his family. This past Friday night we had our annual fundraising event, Room For Dessert. The goal for the evening was to raise $15,000 to go towards additions to our program in 2018. It was apparent that our guests grabbed hold of the impact we hope to make in Rwanda next year! We are overwhelmed and extremely grateful for their generosity! As of right now, we have raised $7,000 over our goal! We shared that our plans for 2018 will directly impact 176 individuals, with scholarships or health insurance. Due to the kindness of our guests and others, that WILL happen! We are so excited for the three changes to our program in 2018! First of all, we will be providing 34 scholarships for primary school! We'll support the younger brothers and sisters of our students. We love the chance to be able to form a relationship with kids when they are young and continue that guidance well into high school. We'll be providing some of the same benefits as our other scholarships - school fees, school materials, health insurance, uniforms, and igikoma. Igikoma is a porridge-like breakfast that each of our kids will get every day before school. This meal might be only one of two the kids will have the entire day. Our Primary school scholarships cost $85/year. Secondly, we will be adding a couple of Secondary and Vocational School scholarships to our program, bringing that total to 50 kids in Secondary or Vocational School. Our Secondary/Vocational school scholarships cost $400/year or $33/month. We will also be providing health insurance to all of our students' family members, an estimation of 92 individuals! Health insurance for one individual costs $4/year. CLICK HERE TO BE INVOLVED! Muhozi Christophe is one of our students in his first year of secondary school. He is the oldest in his family with several younger siblings still in primary school. Christophe’s family faced the loss of their mother when she left to live in Uganda when the kids were young. While still feeling this hurt, they have been strong together and with the support of their grandfather who is a local pastor. While Christophe is just starting his years of secondary school, he is an older student at 17 years old. He is glad for this new step on his journey even if there are challenges along the way. He received the honor of being elected a class leader by his peers because they see his discipline and confidence. This is seen at home as he wakes up each morning excited to go to school and helps the rest of the family wake up, too! Christophe is working hard in his studies with the hope of one day being an engineer working with airplanes. His favorite subject is math which will help him to achieve this dream. In his free time, Christophe enjoys drawing landscapes, people being together, and people singing. He is very talented! We are grateful that Christophe is thriving in secondary school! Thanks for your support! Turatsinze Raphael is the papa of a student newly sponsored by Global Capacity this year. While we are still getting to know this family, I’d like to share a little bit of Raphael’s story and how his family is impacted by this opportunity of continued education. Raphael (55 years old) and his wife, Niwemwiza Ernestine, are not legally married but they have been together as a family with their three children for 21 years. While legalizing their marriage is preferable and they are committed to each other, they are not able to give the dowry that is expected by her parents and so remain unrecognized as a legally married couple. Their daughter passed away suddenly a few years ago and their two sons are both currently in secondary school: Mugabonejo Darius Bienvenu is in Secondary 6 (sponsored by another organization) and Karimbi Lambert is in Secondary 2 (sponsored by Global Capacity). For several of the past years, Raphael worked as a driver. Unfortunately, he was diagnosed with a kidney problem and the doctor instructed him to stop driving since sitting for long periods of time was impacting his health. He is feeling better and the kidney problem has improved, but he has been unemployed for about a year and the family is struggling to meet their daily needs. Raphael has also been able to secure a few part-time driving jobs now and then but has not been able to secure consistent income and worries about being able to find permanent work since he is an older man competing with younger men for the few available jobs. Ernestine was able to find a job at a market in another part of town selling fabric for someone else. Thankfully, this has provided the family with some income but the sales at the market have been minimal in recent months. The beautiful thing about Raphael, seen each time we meet with him, is that he exudes joy and hopefulness. He is indeed struggling to provide for his family and he wishes that circumstances were different. Yet, he does not have the attitude of a victim and chooses to remain actively hopeful that these circumstances will improve. Raphael continues to make efforts to find work, and, in the meantime, spends time at home cooking and doing other household tasks to care for his family. He is deeply grateful for the provision of the school sponsorship for Lambert as this brings peace and lifts a part of the burden from his shoulders. Thanks for helping to encourage this papa!